The Givrais Thunder Bird has been a part of life on Farah’deen for generations. Before the Great Storm, the fringe settlements of the Sariyd Empire told tales of birds that foretold the coming of lightning, and in northern Farah’deen, the bird was incorporated into regional mythologies and deities. They were also helpful to the Qadir in a practical way as areas where they flew were quickly cleared or protected from the coming lightning strikes. 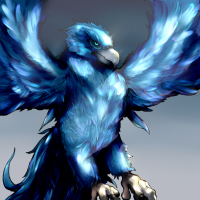 When the Great Storm came, the bird was originally believed to have been wiped out by the hostile event however scattered reports eventually confirmed its survival by 140 AC. The Songaskians and their Masaya dismissed the bird and only saw it as a practical tool for survival. By 220 AC, the animal was involved in the iconography of the northern Farah’deenic states, particularly in Malifant due to its excess of nesting locations for the bird. Soon after this rise in popularity, foreign traders from Ithania took an express interest in the bird for fashions back in the homeland as the bird’s varying plumage was perfect for a wide variety of products. Unfortunately for them, the Songaskian Masaya arrived in the region and were heavily restrictive on what these traders could do, though Hadravia remained open to their fellow Ailor. In more recent years, the Givrais Thunder Bird has seen a slow decline in its population. The First and Second Songaskian War harmed their habitats and their numbers, further exasperated by the Songaskian Civil War which followed. However, with peace now restored and food becoming more available for all, hunting of the bird is likely to return to normal levels, and they can resume their high-flying and thunder-loving lives. The Givrais Thunder Bird is one of the largest birds in Aloria and can reach a length of four and a half to five feet and a weight around 130 to 140 lbs and their wingspan can be over 10 feet. The bird has vibrant blue eyes, with a mohawk of gentle, soft gray feathers lining the top of its head. Their talons are a pearly white while their feet are a light gray and slim in appearance. The Thunder Bird has a color palette of different greens, purples and blue with gray accents, the latter two more commonly found on their undersides. There is no specific pattern beyond this general divide on their feathers, making each unique in appearance. The diet of the bird consists primarily of the Hagaan though insects and other reptiles are also eaten. It is not known how the Thunder Bird has been able to resist the toxins of the Hagaan, but it does show that their digestive systems are incredibly resilient. The Givrais Thunder Bird has an equal population ratio of male to females. However, male thunderbirds are significantly larger than their female counterpart, often puffing out their feathers as a show of dominance and masculinity. Females, on the other hand, sleek their feathers though their tail feathers are always longer than the males by an inch or two. Givrais Thunder Birds are born inside large, hard-shelled eggs atop the cliffs of Farahdeen. For many weeks they are protected by their mother in an incubated state, kept warm and safe by her vibrant feathers. After they hatch, the father will return from hunting and regurgitate the digested food into the mouth of his young, aiding the chicks in gaining their strength. In a matter of days, they will develop flight feathers, learning to fly and preparing their take off into the wild. Soon after flying they will be on their own, and in the coming year, they will be having their own clutch of eggs. Thunder Birds can live for up to 30 years. The Givrais Thunder Bird is a predatory species of carnivorous bird. They commonly prey on the reptiles and insects of Farahdeen. In a particularly brutal way, they very rarely outright kill their prey, instead holding it in their beak or talons until they reach rocky ground. There, they will pummel them into rocks until dead. It does this to break the bones or crack of the exoskeleton of its prey. Toward sentient races the bird has been shown to be unpredictable, liable to calm and close observation before growing aggressive and flying at them. Due to these seemingly random emotional fluctuations, it's virtually impossible to domesticate and keep a Givrais Thunder Bird in captivity. The Thunder Bird is an extremely close-knit colony, protective of their own. They are often found high on cliffs or canyon walls in northern Farah’deen. They often create their nests on hangovers and crumbling structures, and it’s not uncommon a skeleton or two of a deceased young or baby Thunder Bird at the bottom of the steep drop. Within their groups, there is never a set alpha, and each chooses to do their own thing except for when a storm approaches and lightning is more likely. During these times, they often fly together as a loose flock to the site and wait until it has struck before returning to their unorganized ways. A Thunder Bird’s caw is one of the loudest out of all known birds. Some say the people of Farahdeen can be driven to madness by its frequency. The Givrais Thunder Bird has a rather unique taste. Some say it's almost as if a blend between beef and pork. The official name for the Thunder Bird was given for the merchant and game hunter Givrais Salondre who brought the first corpse back to Ithania. This page was last edited on 1 December 2018, at 14:00.